- "Every time I play a video on Facebook/YouTube, it starts to be glitchy and black until it gets 6 or so seconds into the video or I drag the slider back to the start. It's really annoying. I've upgraded to windows 10 and the issue is still here. I'm running 2 Crossfire AMD Radeon HD 7800 Series and the issue has been happening for the past 4 months. Any suggestions or should I just download Facebook videos?" Seriously, YouTube or Facebook video download is not essential if watching FB videos online is what you are doing most of the time. Well, being caught in the aforementioned situation should be an exception. And occasionally, you may want to extract and save movie/music videos on Facebook in HD resolution for playback offline with no buffering or stuttering, in case no WiFi is available and 4G/3G signal is low. So how to download video from Facebook? In this particular case, a Windows 10 YouTube/Facebook downloader works quite well. Q - "How to download videos from Facebook to computer? Can you help download a video from Facebook to my computer in any format? It doesn't matter as long as I can convert it! thx!" Q - "Sometimes I need to download videos from Facebook, but I don't like online Facebook video downloader because too many ads and ads over. Is there way to download Facebook videos in HD resolution without online downloader?" Online Facebook video downloader is enough to cope with your very basic Facebook video download. But due to the next two reasons, you should grab a best Facebook video downloader software right off the bat, be it free or paid: 1. Keepvid.com has 51 supported video sites and savefrom 34 sites, while Facebook video downloader software, like WinX YouTube Downloader, supports 300+ video sites, including Facebook. There is no clear data about ClipConverter. cc; 2. It seems like ClipConverter. cc only allows you to download and convert video from Facebook/YouTube to MP4/3GP/AVI/MOV. If you prefer much more output formats or profiles, an all-in-one Facebook video downloader converter will better meet your needs. > To free download video from Facebook, get WinX YouTube Downloader at no cost! Take downloading Facebook videos to MP4 as an example: launch the HD Facebook downloader, click "URL" button, copy a Facebook movie video link, Paste & Analyze it. Tips: Facebook videos load automatically and you need to right click to check the URL. 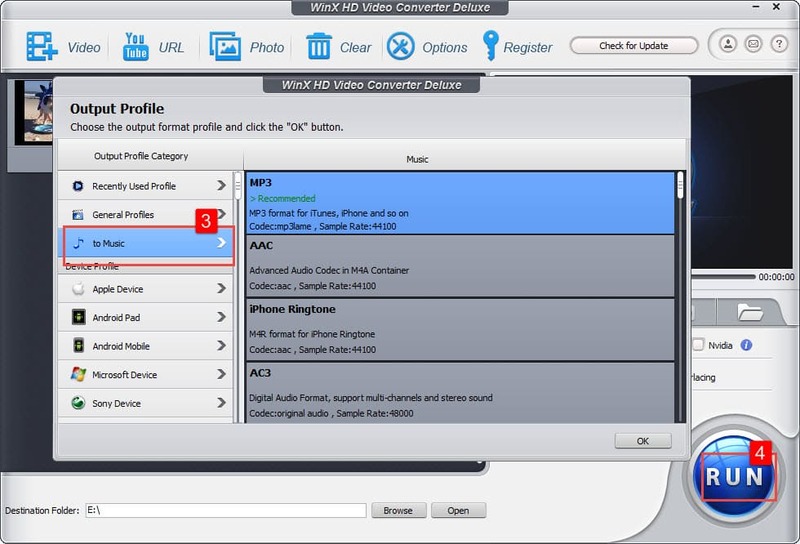 Select your desired video resolution and press button OK. To download and convert video from Facebook to MP4/MP3 or iPhone/iPad/Android, check the "Auto convert" box. Then Output Profile -> General Profiles -> MP4 Video or Output Profile -> To Music -> MP3. Set a non-system disk to be the destination folder and tap button RUN to start downloading SD/HD videos from Facebook. Q - "How can I download FB videos to my computer by Google Chrome?" - "How to save video from Facebook via Chrome/safari?" Another way to access to Facebook video download free is to add Facebook video downloader extension to Google Chrome/Firefox web browser. Well, some people think it really works while others label it as useless add-ons. If you want to have a try, there are some recommendations: Facebook downloader extension for Chrome, Facebook downloader add-on for Firefox, etc. Well, if you get into troubles with those browser extensions, such as "it doesn't work", "no options for SD/HD" or others, we suggest you look back for a best free Facebook video downloader software. 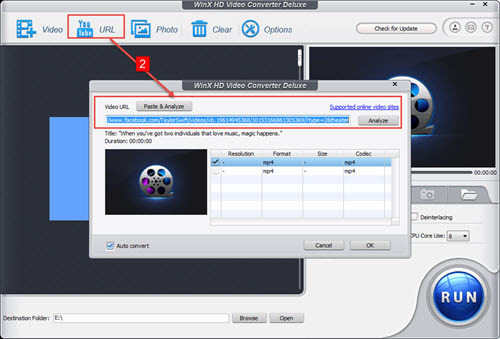 To download and convert Facebook/YouTube/Vimeo/DailyMotion videos in HD resolution on PC/Mac, please go to WinX HD Video Converter Deluxe.